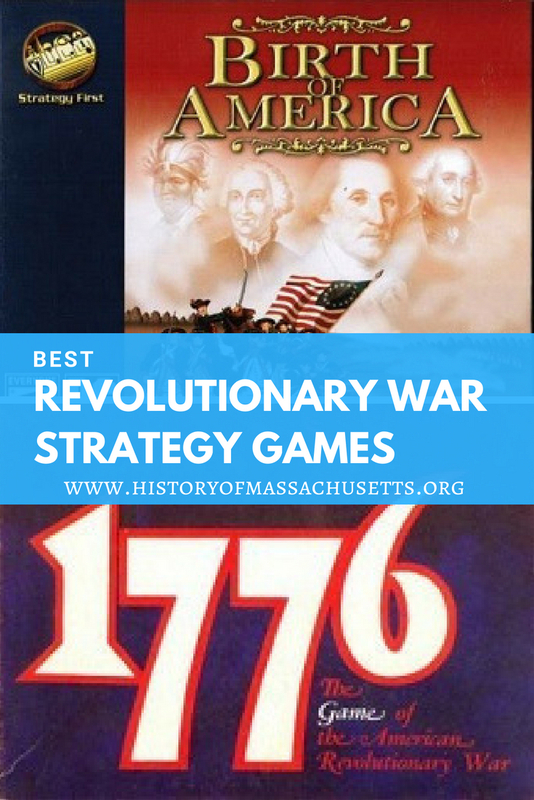 If you are a Revolutionary War buff who also likes games, you’ll love these Revolutionary War strategy games. These games are based on the actual military strategies of the Revolutionary War. While there aren’t a whole lot of Revolutionary War-themed strategy games out there, the ones that do exist are considered excellent games. Released in 2006, Birth of America is a turn-based strategy video game by Ageod that covers two of the most important wars in colonial America: the French and Indian war and the American Revolution. The game covers all of North America, from Florida to Quebec and from New England to Mississippi in over 700 accurately drawn provinces. Players control the majority of the military action such as building forts, engaging in sieges and blockades, raiding enemy settlements and participating in battles on both land and sea. Players are also involved in the political action as well since political power plays can affect the outcomes of various events of the war. The game features 10 different scenarios covering both the French and Indian War and the American Revolution. Scenarios range in length from a few months to almost nine years. Troops are controlled at the regimental level and can be arranged into various attachments, naval units are formed in squadrons and flotillas. Players also have their choice of over 100 historical leaders to lead their troops. “Pros: A stunningly beautiful game which covers a period lacking much prior attention. Super AI and very challenging, yet also easy to jump right in and play. All the factors of warfare in the era (leadership, logistics, population control, and so forth) are included. If you have any interest at all in this time, buy it and prepare to write off all your spare time. It is that good! Cons: Documentation needs work and lack of a decent soundtrack are the only weaknesses in an outstanding simulation. The game has a 6.8 rating on IGN.com and a 6.9 rating on gamespot.com. Released in 2009, Empire: Total War is a turn-based strategy video game by Creative Assembly that focuses on the early modern period of the 18th century. Players can choose which world power they want to play as. Their options include Great Britain, Prussia, Sweden, France, Poland-Lithuania, Spain, Austria, Russia, the United Dutch Provinces, Maratha Confederacy, the Ottoman Empire and the Mughal Empire. Players try to win their campaign through military force, espionage, diplomacy and economics. Although the game is mostly turn-based, the battles are fought in real-time. In addition to the standard campaign, a special campaign, titled “Road to Independence,” also follows the development of the United States from the time of the Jamestown settlement to the American Revolution. The game has a 8.5 rating on gamespot.com, very positive reviews on steam, a 9.5 rating from IGN and a three star rating on Amazon. Released in 1992, Liberty or Death is a turn-based strategy video game by Koei that allows players to play as either the Americans or the British in the Revolutionary War. Players can choose to control any of six historical commanders: George Washington, Artemas Ward, Charles Lee, Thomas Gage, Sir Henry Clinton or William Howe. The specific strategy used to win the game is determined by which side you play. The American strategy, just like in the actual Revolutionary War, is to hold out against the British and gather their strength while the British strategy is to fortify their positions and take action against the Americans. Each turn lasts two weeks, for a total of 24 turns per year. The game received good reviews when it was released and was praised for being historically accurate but many reviewers noted that game’s excessive details and micromanagement makes it a bit trying at times. The game has a 7.3 rating from player reviews on gamespot.com and an 8.0 rating from IGN. Released in 2005, Sid Meier’s Civilization 4 is a turn-based strategy video game that allows players to build a civilization from scratch using limited resources. The game is not exclusively about the American Revolution but features an American Revolution scenario. If the game’s time limit runs out and none of the main objectives have been fulfilled by any players the civilization with the highest total game score is the winner. The game has a 9.4 rating on gamespot.com, a 9.4 rating on IGN.com, a score of 94 on metacritic.com and a 3.4 rating on Amazon. Released in 1974, 1776 is a two-player strategy board game by the Avalon Hill Game Co and is one of the best-selling Revolutionary War strategy board games on Amazon. The game allows players to reenact six Revolutionary war battles with multiple scenarios. The game has a 6.4 rating on Boardgamegeek.com, where it is ranked 650 in the war games category and has a five star rating on amazon. The game is designed for ages 12 and up and has a 120 minute playing time. Released in 2003, Liberty: The American Revolution 1775-83 is a two-player block war game by Columbia Games that covers the entire span of the war from 1775-1783 and allows players to play as either the British, Americans or the French. The role of the Native Americans in the war is also depicted. Released in 1994, We the People is a two-player strategy board game by Avalon Hill Co that was one of the first card-driven war games. The game uses a deck of battle cards to resolve conflicts between troops instead of dice. The overall progression of the game is determined by a deck of strategy cards, which mark certain historical events during the Revolutionary War, and each card has multiple purposes depending on which side (American or British) is attempting to use it. The game is designed for ages 12 and up and has a playing time of 120 minutes. The game has a 7.3 rating on Boardgamegeek.com, where it is ranked 98 in the war games category, and has a four star rating on Amazon. Released in 2010, Washington’s War is a two-player strategy board game by GMT games. It is a card-driven game with a dice-driven combat system. The game pits King George III against the American colonists in a fight for their independence. Players can play as either King George III, as he tries to gain back control of the colonies while also dealing with a global war against old enemies looking for revenge for the Seven Years War, or they can play as the Continental Congress, as they wage war against Britain while trying to drum up support from their fellow countrymen. The game is designed for ages 12 and up and has a 90 minute playing time. The game has a 7.7 rating on Boardgamegeek.com, where it is ranked 33 in the war games category, and has a five star rating on Amazon. Released in 2014, End of Empire: 1744-1782 is a two-player strategy board game that covers three conflicts in North America between 1744-1782: King George’s War, the French and Indian War and Revolutionary War. An additional bonus scenario covers the War of Jenkin’s Ear between Spanish Florida and British Georgia. Each turn represents two months. Each year consists of one spring turn, two summer turns, one fall turn, and two winter turns. The game features two maps of eastern North America and each hex is approximately 20 miles across. The game is designed for ages 12 and up and has a playing time of 360 minutes. The game has a 7.6 rating on boardgamegeek, where it is ranked 1,449 in the war games category, and has a five star rating on Amazon. In addition to the games listed here, another type of Revolutionary War strategy game is AWI wargaming with AWI miniatures. For a list of American Revolution games that aren’t strategy-based, check out the following article on the Best American Revolution Games. “Liberty or Death”. GamePro. IDG. May 1994. p. 119. I’m assuming you’re asking where you can buy they. Well, some of them are available on Amazon, while others are on sites like Steam and others are out of print and can only be purchased used on sites like Ebay. It all depends on the individual game. If the game is available on amazon I obviously link to it but if it’s not there’s no link. I assumed gamers know exactly where to get games but I’m guessing that isn’t the case. Perhaps I’ll link to them on steam or just mention where they are available for purchase.